Ever since Tim Russert asked Dennis Kucinich the “did you see a UFO” question during the October 30 Democratic Presidential Debate, there have been a flurry of UFO questions to other White House hopefuls. Bill Richardson, the governor of Roswell has faced the UFO question many times during this Presidential campaign partly because a few years back he wrote a forward to a book about an archeological dig done in New Mexico looking for evidence of the rumored 1947 flying saucer that crashed outside of Roswell, New Mexico. He has replied to all the UFO questions by saying that he doesn’t believe in UFOs, but thinks the government did not release all the material on the 1947 crash, and is all in favor of the tourism that the UFO subject has brought to Roswell. Mike Gravel, the ex-Alaskan senator, said he was a believer, whereas Republican Mike Huckabee said he believed in G-O-D rather than U-F-O. Even ex-president Jimmy Carter got dragged in when Dennis Kucinich defended his sighting, by saying that Jimmy Carter had one prior to his becoming President. One of the few candidates that has not faced the UFO question is Democratic frontrunner Hillary Clinton. This is despite the fact that her strategist Mark Penn complained that questions about outer space were easy questions compared to what poor Hillary was forced to answer during the October 30th debate. Secondly, it is strange that she is being avoided because Hillary has never hidden the fact that she once wanted to be an astronaut, and was turned down by NASA who told her girls need not apply. Hillary also played a role in appointing the first woman, Eileen Collins, as a commander of a space shuttle. Most importantly, it is strange that Hillary was not asked because Hillary is not exactly a stranger to the subject. As Herald Tribune journalist Billy Cox put it “you had to wonder if Hillary Clinton’s heart was fluttering just a little harder Tuesday night as Russert asked why her husband had written the National Archives requesting that their correspondences during his White House years remain sealed until 2012.” This might be because Hillary had to know that a good percentage of the FOIAs filed with the Clinton Library deal with the role of the Clintons in trying to bring openness and disclosure to UFOs during Clinton White House years. The fact that the Clintons, particularly Bill, had an interest in UFOs is no big secret in the UFO research community. After all there are over 1,000 pages of documents from the office of Clinton’s science advisor that were released while Bill was still in office. It was partly these documents that provided the names and dates for all the present FOIAs now sitting in FOIA queues at the Clinton library. In addition Webster Hubbell, Bill Clinton’s close friend and Associate Attorney General at the Justice Department, stated in his 1997 book “Friends in High Places” that Bill Clinton had asked him to look into two items 1) Are there UFOs? and 2) Who killed JFK? And so what of Hillary? Later UFO researcher Darrel Sims would tell me almost an identical story of a woman claiming to be a friend of Hillary’s coming to him looking for material for Hillary and the President. Later the woman returned stating Hillary and the President enjoyed the material, and there was a way for Simms work to receive funding. Simms turned down what was proposed. 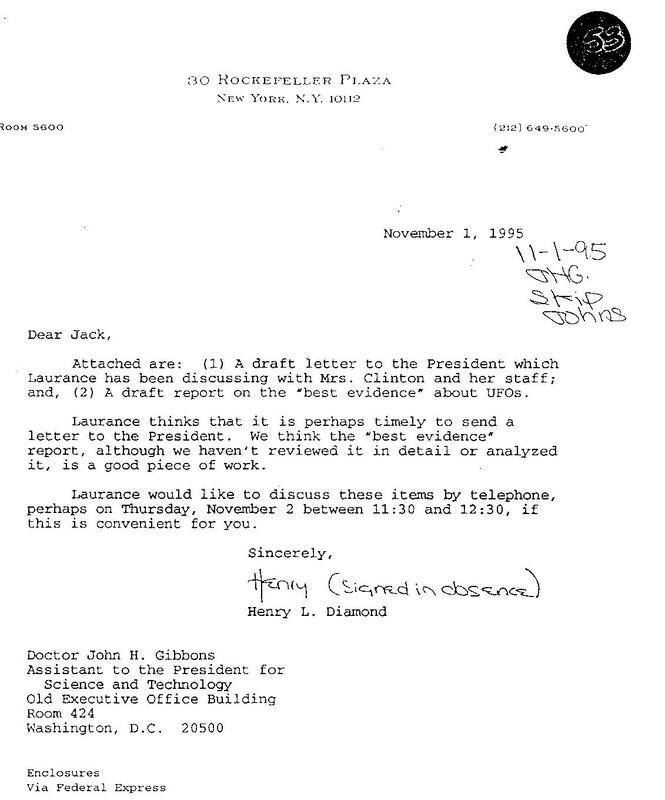 The documents obtained from the White House office of President Clinton’s science advisor to also show Hillary role in the effort to gather UFO material. 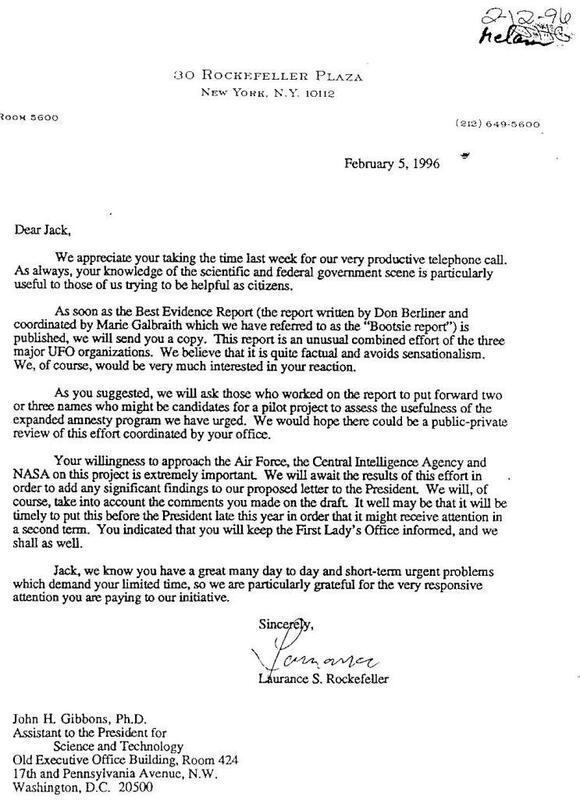 Even more dramatic is a letter written by Rockefeller’s lawyer Henry L. Diamond on November 1, 1995 with the draft of a letter on “Lifting Security on Information about Extraterrestrial Intelligence as a Part of the Current Classification Review.” (Diamond was tying UFO disclosure into executive order 12958 on April 17, 1995 issued by Bill Clinton requiring his intelligence agencies to allow for the de facto declassification of papers 25 years or older, provided they did not compromise nuclear secrets, intelligence sources and methods and a host of other security concerns. The stories are almost unanimous opinion within the UFO community that Hillary Clinton sat down with Laurance Rockefeller in August of 1995 (while the Clintons vacationed at his Wyoming ranch) to listen to Rockefeller’s pitch for disclosure. The question the present FOIAs will attempt to answer is was the President also there. 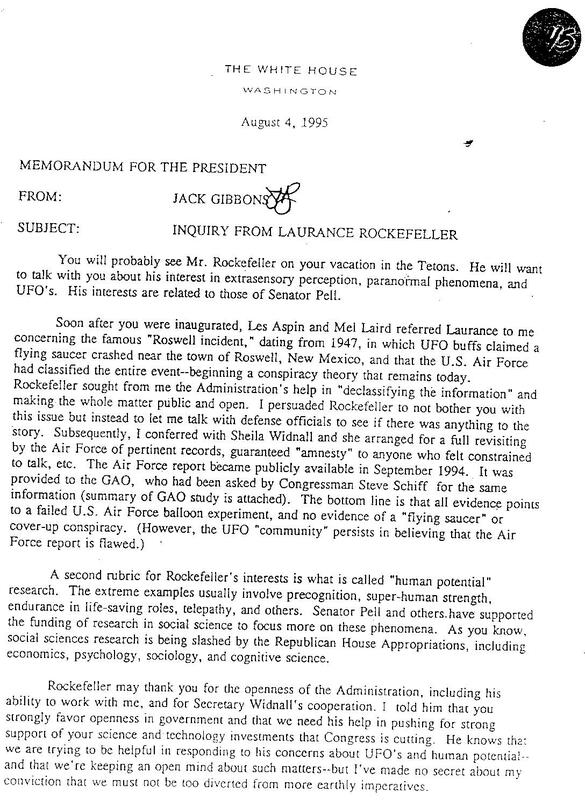 He was supposed to be there but received a letter from the Science Advisor days before hinting he should not meet with Rockefeller (See document). Why? Well during the 1992 presidential campaign Hillary had said “We’ll have a woman President by 2010.” She may have realized she might be that President and should therefore watch which issue she hitches her wagon to.